Jane R. Willson is a figurative painter who creates historical narratives in a magical realism style. Her current work explores ancient folk and fairy tales, using eastern and western painting techniques that span traditional and digital media. She has painted and curated six solo exhibits since 2009, all of which focus on historical phantasms—from antiquated beasts (as depicted by Pliny) and the Ukrainian Red Forest, to ancient fairy tale narratives as they play out in contemporary culture. 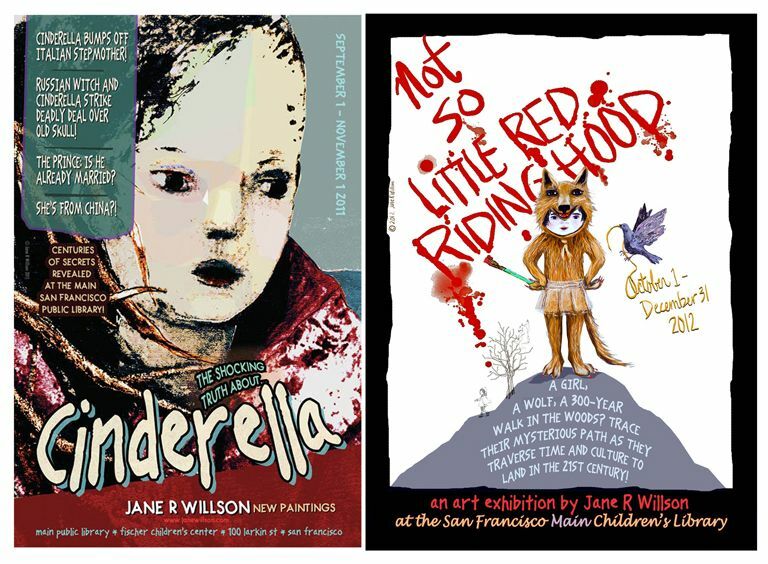 Two of these exhibitions, “The Shocking Truth of Cinderella” and “Not So Little Red Riding Hood,” were held at the San Francisco Main Children’s Library in 2011 and 2012. Jane is also a recipient of a Puffin Foundation grant for her upcoming fine arts book on a visual history of the roots the Red Riding Hood tale. The visual narrative plays such an important role in your work–why so? I think it’s just the way I’m wired—to observe, to look for the hidden meaning behind things. 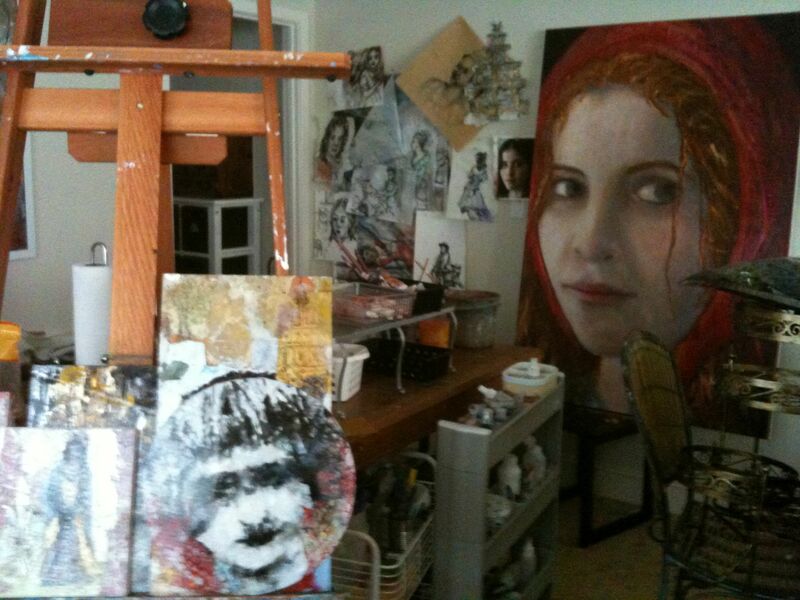 Like when I paint a portrait, I can’t help but intuit a narrative, an inner story beneath the mask of the face. Of course, any good shrink will tell you it all stems from childhood—a combo of nature and nurture, or visa versa. In my case, I blame my father for my penchant for visual story. That’s what parents are for, right, to blame them for things? Anyway, my dad was an only child who escaped his childhood armed with a bounty of familial stories, and no one to tell them to—everything from his great grandfather shaking the hand of Lincoln, to his harrowing canoe trips through the wilds of Minnesota. Best of all, he had these magical tales he learned from his English grandfather. They starred an irreverent cast of Oscazillars, Rangaboos, and a pocket-sized Maffifin. The Maffifin by the way, dined on the bristles of old shaving brushes! So when I came along, a mid-century girl, my dad finally had his audience. His stories thrilled me then, and still do—and they became the pillars of my early creative life. Back to me: I have this theory, or, maybe it’s like an ideology: it’s that life is more of a collection of narratives than anything else. Even on a base metaphysical level, I feel more of a self, flowing along an invisible river of story, than a self, living in static substance. It feels so natural, when I paint, to seek the nuanced layers of narrative, inherent in the larger visual story. How did you get into working with folk and fairy tales as your subject matter? There’s a story in that story, which begins one day in mid-summer 2009. This day I’m gazing around my brand new-to-me empty 29th Street studio. It’s a virgin space: one long empty room leading into another small room. I’m ecstatic. I’m scared to death. This space could change my work, I muse. A few years prior I had been painting large-scale. I was stretching and priming my own 40” X 60” linen canvases, and painting, in water soluble oils, these faces so huge I saw them more as bio-narratives. I built up each face in multi-layers of thin washes. There was this translucent quality that pleased me, up close and far away. And then? I suffered a head injury. Though a "mild" concussion, it wreaked havoc with my visual juju. I was exhausted when I tried to paint or even think in "big." I had to stop doing the work I loved. I felt angry, cheated. But eventually I saw I could take this "time out" to learn something new, like Asian painting. In Chinatown, I found these great "how to sumi paint" books in an art supply store. They were written in Chinese, but had beautiful self-explanatory drawings. After a ton of practice I could draw a fast fluid line with the brush, using various strokes and "colors" with the black stone-ground ink . And then I saw San Francisco as my studio. I was capturing people in motion on the streets, in cafes, even musicians performing live music. Sumi painting changed my way of seeing. I giggle. So what the devil do I paint now? And then a memory floats in—of me as little girl reading of myths and fairy tales. And now I contemplate the rich psychological layers of fairytale fodder—a feast for a narrative painter. I had no clue then what form my fairy-tale work would take—that was scary—but the decision to go there felt right. It must have taken a lot of research to discover “the shocking truth of Cinderella”, that Cinderella originated in 9th century China, and has taken many incarnations since. Tell us about that process of discovery . When I started researching Cinderella, and all the tales for that matter, I began with, in retrospect, a naive hypothesis. I thought I’d do some quick googling, and find the first versions of each tale—and paint from there. Easy. Not easy, I discovered. 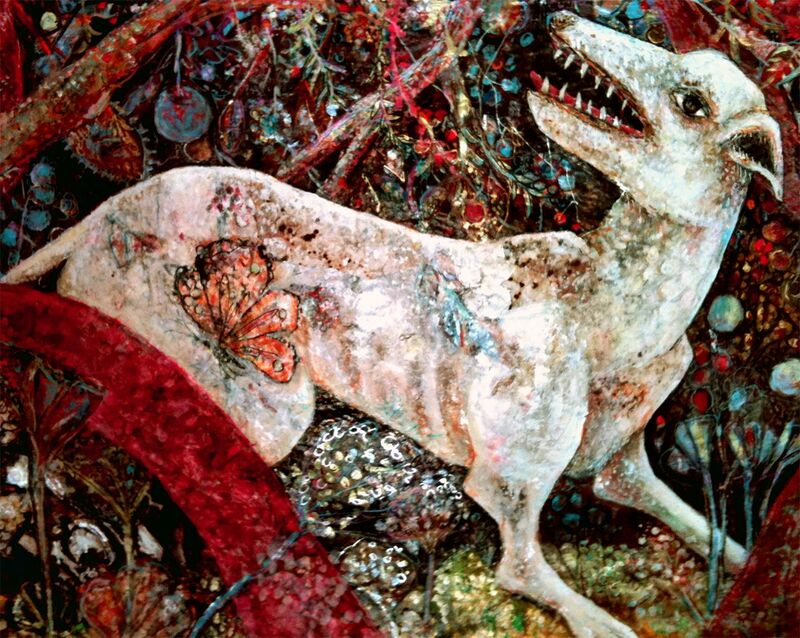 Meanwhile, I forged ahead, revisiting my favorite tales, illustrators, and the works of Paula Rego, Kiki Smith and David Hockney, all artists who have explored the fairytale genre in ingenious ways. Yet still I was floundering: where to go with this painting focus? And then, serendipitously, I met the folklorists. The first was Jack Zipes, one of the world’s foremost folklore scholars, and a prolific writer. After reading some of his pithy books, I adopted him as a mentor. His insights on the evolution of fairytales and gender inspired me. Now I saw my original hypothesis got me nowhere because it was flawed. From Zipes I learned that here’s no conclusive way of knowing the first versions for most of the tales. Yet Cinderella, I soon learned, was a fairytale girl with a more traceable history.In his book, The Great Fairy Tale Tradition , Zipes likens the fairytale to “a mysterious biological species that appeared at one point in history and began to evolve almost naturally, and has continued to transform itself…to the present day.” Zipes’ work led me to other renowned folklorists, including Maria Tatar and Marina Warner. Collectively, they gave me a mini education on the roots of fairytales. To be frank, Cinderella was never my cup of tea. Or was it Disney’s fluffy Cinderella that I didn’t like? Whatever, I coveted the darker tales, like Little Red, Snow White, Hansel and Gretel and Blue Beard. Alas, when I uncovered the truth of Cinderella’s tale I was shocked. Really? She’s from ninth century China? And there’s a Cinderella story for every culture—with more than a thousand Cinderellas worldwide? Now, I felt I owed her, the real thousand-fold multi-cultural Cinderella. So, I painted Yeh-Shen, the first Chinese Cinderella, in oil on linen, and a host of additional cultural Cinderellas. I curated my 2011 “Shocking Truth of Cinderella” exhibit for the San Francisco Main Children’s Library with this body of work. I am eternally grateful to Jim Jeske, the children’s librarian there, for the opportunity to share the magic of the true story of Cinderella in a public forum. So what about Little Red Riding Hood? What role is that tale taking in your work? Little Red’s story has inspired an intriguing new project, a book! I’m really excited about it, but not yet ready to discuss in detail. 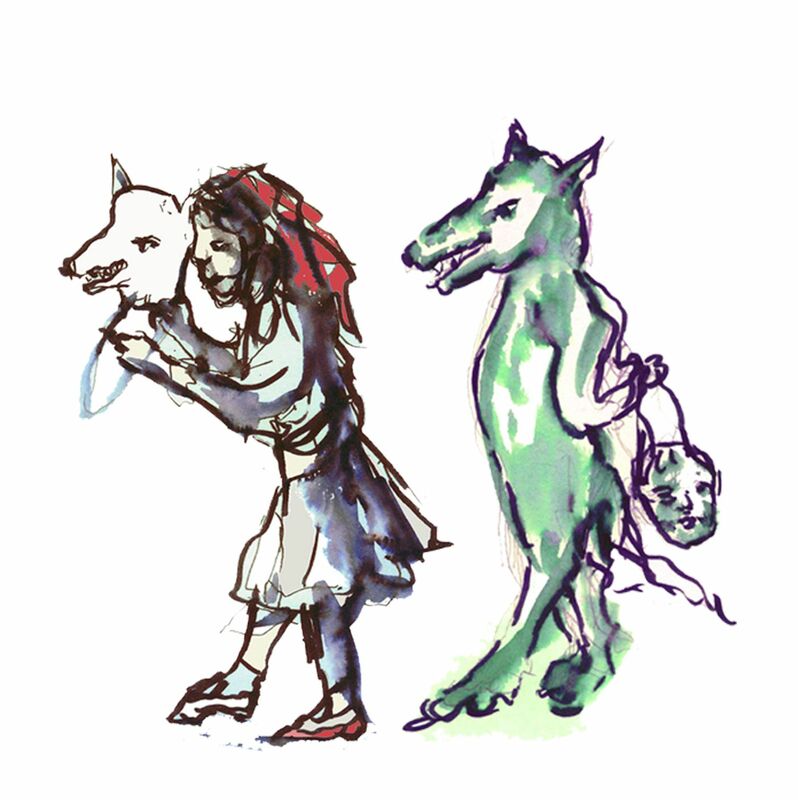 But I can tell you that this new work draws from the imagery I painted for “Not So Little Red Riding Hood,” my second Main Children’s Library exhibition, in 2012. I’ll be posting announcements on my website and through social media channels when this project is closer to ready. Tell us about your artistic process, going from sketchbook to large finished pieces; and about your choice of media. 1.) Something in life serendipitously grabs my interest. I contemplate. 2.) If I can’t stop thinking about it, I start researching in words and pictures. 3.) By now I have probably pulled out my journal, where I write and draw things. This journal is like a paper think tank. A playground. No rules. Not precious. Sentences not complete and drawings loose. 4.) If I still can’t stop thinking about it, I will do a study, more formal drawings, or a digital painting, since I adore painting with my finger on my iPad. 6). If I still can’t stop thinking about it, I’ll just do it. The finished piece is always a surprise. Where can we see your work? Any upcoming shows? I’m pleased to announce my upcoming October solo exhibition, “Abracadabra” at FullCircle Gallery, in San Francisco (October – November 2014). In this exhibit I’m premiering a new body of work: my digital paintings, which will be exhibited in an electronic digital format. The new work spans representational and abstract imagery, exploring magical realism themes and my visual narrative tales. I’m honored to collaborate with San Francisco architect, Ross Levy, in designing the installation strategy for Abracadraba, for public viewing in a small gallery environment. FullCircle Gallery is located at 1286 Sanchez St. in San Francisco. For details on the Abracadabra Exhibition and Opening at FullCircle, see the gallery website. What do you like about shopping at Flax? Take Flax’s paper room. Stepping into it is like visiting a paper museum—one that exhibits indigenous papermaking rituals from world cultures from every continent. Sometimes I have the will power to just pass through and savor all the patterns and textures and pet the papers and not take any home. Then there’s the knowledgeable Flax staff, mostly artists themselves. They know their surfaces, paints, inks, pens, papers, tools, media—even the new graffiti-based art supplies. So Flax is my go-to place when trying something new. There’s always someone on the Flax staff to help me think, technically, about new materials and surfaces. That’s big, because I’m often exploring new techniques, mixing up unlikely art supplies. It’s critical to brainstorm with experts—to help me consider which supplies might best suit my purposes. As any artist knows, you can waste a lot of time and money using the wrong kind of paint on the wrong kind of paper or canvas. Most importantly, I feel at home at Flax, as does Rufus, my adorable 11-lb Chihuahua-Terrier mix. If I were an insecure person I’d leave Rufus at home when I shop at Flax. The staff fusses over him much more than they do me, and he gets snacks. Visit Jane Willson's website for more information.